Each year Cuban artisans and the general public alike await the arrival of the last month of the year, when Havana dresses up for the party and welcomes the men and women who work wonders with their talented hands, producing goods that are practical and marvelous. Every December the Cuban capital becomes a world crafts centre with the arrival of thousands of craftspeople from across the globe to exhibit and sell their beautiful and functional wares. From clothing of all types—menswear, womenswear and children’s wear for all seasons—to footwear for all tastes and occasions, jewelry, ornaments, homeware, furniture, tableware and lighting, the fair features a general abundance of goods to suit even the most discerning tastes. As always, the PABEXPO exhibition centre in the west of Havana will be the event’s main location though it is fast becoming too small a space for so many exhibitors and the huge numbers of visitors who flock to the event every day to enjoy the handicrafts on offer, not least because its timing is also perfect for holiday season gift shopping. This year’s title theme is “Art, Utility and Vocation” and the annual international craft fair known as FIART (Feria Internacional de Artesanía) will take place from December 5th to 17th, convened as always by the Fondo Cubano de Bienes Culturales (Cuban Cultural Goods Fund). 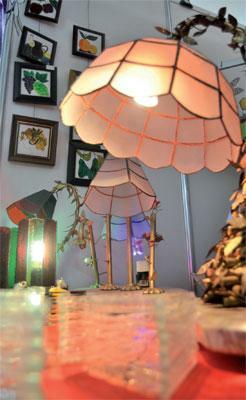 This year the fair is dedicated to the province of Santiago de Cuba and to glassware. As usual the fair will feature workshops on various themes related to contemporary arts and crafts development, and there will be prizes for the top quality products and stands. The event forms part of the Latin American Year of Craftwork (el Año Iberoamericano de las Artesanías) promoted by IBERARTESANIA, an organization set up to promote a plan of action formulated at the fifteenth Latin American Heads of State and Governments Summit (XV Cumbre Iberoamericana de jefes de Estado y de Gobierno) in October 2005. The fair represents an important space for cultural exchange and for working towards the development of artisan craftsmanship on an international level. This is reflected by the pieces on show, which represent crafts and techniques that express the identities and cultural traditions of the places they come from, many diverse regions across the world. An admissions committee is responsible for approving foreign exhibitors whose craftwork should meet those prerequisites.